Figure 1 Representative azo dyes degraded by white rot fungi. degrading system was confirmed by the fact that these dyes were all found to be oxidized by lignin peroxidases. Although initial studies (Cripps et al. 1990) suggested that lignin peroxidases did not oxidize Congo Red, subsequent investigations (Tatarko and Bumpus 1998) showed that this dye is indeed, a substrate for these enzymes. the labeled carbon atoms in the dyes were degraded to carbon dioxide by P. chrysosporium. Among the dyes degraded to carbon dioxide were Acid Yellow, Orange I, Orange II, 4-(3-methoxy-4-hydroxyphenylazo)benzenesulfonic acid, and 4-(2-sulfa-3'-methoxy-4-hydroxyazobenzenesulfonic acid. P. chrysosporium has served well as a model microorganism for the study of the degradation of azo dyes and other environmentally persistent organic pollutants. However, it has been shown that a number of other white rot fungi are able to degrade hard-to-degrade compounds, including azo dyes. Representative azo dyes degraded by white rot fungi are illustrated in Figure 1. As discussed below, some of these fungi have degradative abilities and other properties that will likely make them superior to P. chrysosporium for use in bioremediation systems. White rot fungi that have been reported to degrade/decolorize azo dyes are listed in Table 1. Several Myrothecium spp. and Ganoderma spp. were shown by Mou et al. (1991) to be able to decolorize Orange II as well as two other diazo sulfonated dyes designated as RS(WC) and lOB(H/C). Several experiments were performed using M. verrucaria. Results showed that this fungus was more effective than activated sludge in decolorizing wastewater from a dye-manufacturing plant. Decolorization of wastewater from a textile-dyeing factory was also studied. Five of six highly colored wastewaters were substantially decolorized. 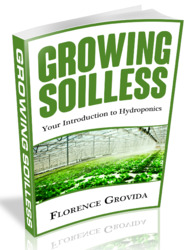 It is interesting to note that some experiments were performed at high pH values, one as high as pH 11. In some wastewaters, the concentration of sodium chloride was as high as 15% (w/v). Adsorption to mycelium was shown to be an important mechanism for wastewater decolorization. In some experiments, adsorption was followed by slow decolorization of the mycelium. However, it should be noted that decolorization of mycelium was not observed in all experiments even after extended (1 month) incubation. The effect of carbon source on the decolorization of water containing Amaranth and Orange G was studied by Chao and Lee (1994). Both dyes as well as the heterocyclic dye Azure B were decolorized by two strains of P. chrysosporium and another unidentified white rot fungus. Interestingly, decolorization was reported to occur if fungal strains were pre-cultured in a high nitrogen medium in the presence of glucose. This is of interest as high nitrogen conditions might be expected to repress expression of lignin peroxidases and manganese peroxidases, enzymes that would be expected to mediate decolorization of these dyes. Knapp et al. (1995) compared the ability of 7 wood-rotting fungi to degrade a variety of dyes, including the azo dyes, Mordant Yellow 10, Cibacron Brilliant Yellow 3G-P, Cibacron Brilliant Red 3B-A, Orange II, Brilliant Yellow, Chrysophenine, Chlorazol Yellow, and Acid Red 106. Results were variable in that all of the fungi were able to degrade extensively some of the dyes. No strain was able to degrade extensively all of the dyes. It is interesting to note that P. chrysosporium, was able to mediate 99-100% decolorization of 4 of the 14 dyes and 27-69% decolorization of the other 10. Nevertheless, P. chrysosporium was among the least effective of the fungal strains investigated. This study shows clearly that the biodegradative abilities of P. chrysosporium are substantial, but it is necessary to assess the biodegradative abilities of other white rot fungi as many will have even greater abilities. These investigations also showed that no one species of fungus was best for all of the dyes studied. however, was the observation that some dyes were more extensively decolorized by a lignin peroxidase preparation from P. chrysosporium. For example, 6.6% decolorization of the azo dye Acid Orange 74 was observed in solid agar cultures of P. chrysosporium. However, when incubated in the presence of hydrogen peroxide and lignin peroxidase from this fungus, 79.1% decolorization was observed. In some cases, the opposite was observed. In solid agar culture, 98% decolorization of Acid Black 24 occurred whereas when this dye was incubated with lignin peroxidase in the presence of hydrogen peroxide, only 25.4% decolorization occurred. Shin and Kim (1998) showed that a peroxidase isolated from Pleurotus ostreatus decolorized several types of dyes including the azo dyes Congo Red and Methyl Orange. After 4 min, 77 and 26% decolorization of these dyes was noted. Of interest was the observation that addition of veratryl alcohol did not enhance the rate and extent of decolorization. This is in contrast to the observations by Ollikka et al. (1993) for lignin peroxidase from P. chlysosporium. Martins et al. (2001) synthesized several azo dyes having substituent groups [2-methoxyphenol (guaiacol) and 2,6-dimethoxyphenol (syringol)] that would be expected to be found in lignin. Such groups were designated as bioaccessible as they would be expected to be attacked by enzymes from lignin degrading fungi. Not unexpectedly, the extent of dye degradation depended on the concentration of sucrose used as a growth substrate and on the structure of the dye. Interestingly, degradation also depended on the structure of the dye present in cultures of P. chrysosporium that were allowed to grow in the presence of the dye and, presumably, the fungus became acclimated to the dye. This is similar to the approach taken by Paszczynski et al. (1991) who synthesized from Acid Yellow 9 and from sulfanilic acid two azo dyes having guaiacol groups. In this study, P. chrysosporium degraded these dyes more readily than the parent compounds that lacked the guaiacol group. Interestingly, none of the Streptomyces spp. degraded the parent compounds and only 5 of the 9 Streptomyces spp. degraded the new guaiacol-linked azo dyes. Pasti-Grigsby et al. 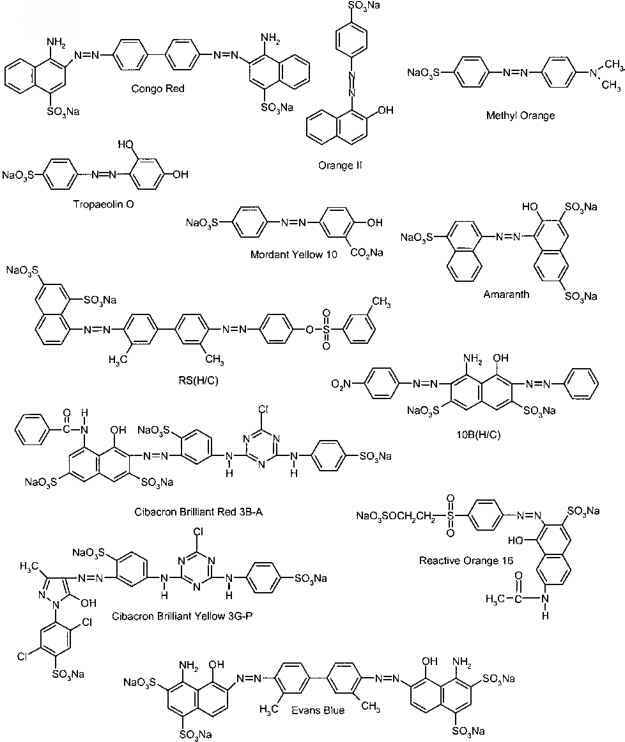 (1992) synthesized 16 azo dyes and assessed there ability, along with 6 commercially available azo dyes (Methyl Orange 52, Ethyl Orange, Acid Yellow 9, Acid Orange 12, Orange 1, and Orange 2), to be degraded by P. chrysosporium and by Streptomyces spp. P. chrysosporium decolorized all of the newly synthesized dyes and the commercially available azo dyes. Most of the newly synthesized dyes underwent substantial (i.e., # 85%) decolorization when the initial concentration of dye was 150 mg/L. However decolorization ranged from 27 to 99% at this concentration and from 15 to 97% when the initial concentration was 300 mg/L. Novotny et al. (2001) studied the biodegradative ability of 103 strains of wood-rotting fungi. A strain of Irpex lacteus and a strain of P. ostreatus were selected for further investigation to decolorize several different types of dyes including the azo dyes Congo Red, Methyl Orange, Reactive Orange 16, Reactive Black 5, and Naphthol Blue Black. Both of these fungal strains substantially degraded representative azo and diazo dyes as well as anthraquinone, heterocyclic, triphenylmethane, and phthalocyanine dyes. It is worth mentioning, however, that the diazo dye, Congo Red appeared to be one of the dyes that was comparatively more resistant to degradation. I. lucteus caused only 58% decolorization of this dye during 14 days of incubation. Recently, several other white rot fungi have been shown to be able to degrade azo dyes. Heinfling et al. (1998a,b) showed that Bjerkundera adusta is able to degrade azo dyes. 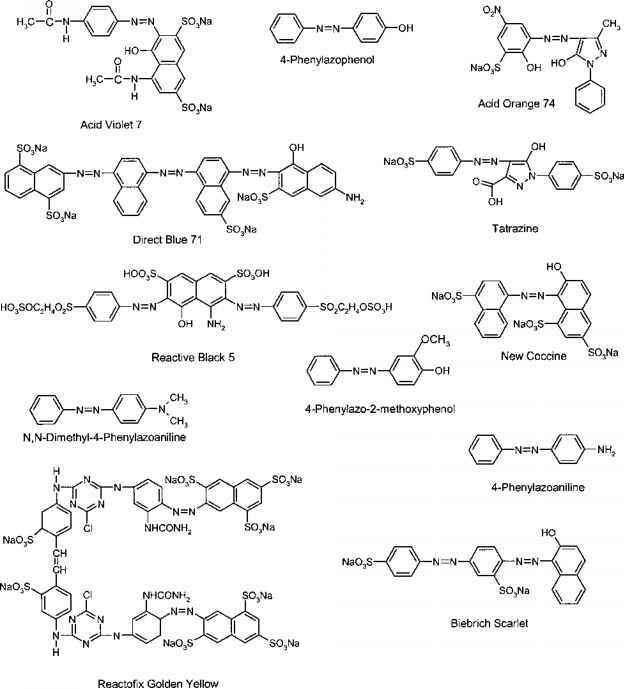 These authors have also purified and characterized manganese peroxidases and lignin peroxidases from this fungus and have documented their involvement in azo dye degradation. Azo dyes degraded by B. adusta include Reactive Violet 5, Reactive Black 5, Reactive Orange 96, and Reactive Red 198. It is worth noting that B. adusta is the most common Bjerkandera species in Europe (Heinfling et al. 1998a). Swamy and Ramsay (1999a,b) studied the ability of P. chrysosporium, Bjerkandera sp. BOS55, P. ostreatus, Trametes hirsuta and T. versicolor to decolorize 6 dyes, including 4 azo dyes, in solid plate cultures. P. ostreatus was not able to decolorize any of the dyes (the azo dyes Amaranth, Remazol Black B, Tropaeolin O, and Remazol Brilliant Orange 3R and the phthalocyanine dye Reactive Blue 15 and the anthroquinone dye Remazol Brilliant Blue R) under investigation. Bjerkandera sp. BOS55 and Trametes versicolor were most effective in their ability to decolorize these dyes. Both were able to decolorize all of the dyes to some extent. P. chrysosporium and T. hirsuta possessed intermediate decolorization ability. P. chrysosporium did not decolorize Remazol Brilliant Orange 3R and only marginally decolorized Tropaeolin O. This fungus did cause substantial decolorization of Amaranth, Remazol Black B, and Reactive Blue 15. T. hirsuta decolorized Amaranth and Remazol Black B. T. hirsuta did not decolorize Remazol Brilliant Orange 3R and only marginally decolorized Reactive Blue 15 and Tropaeolin O. It appears that the ability of a given fungus to decolorize a dye depends on certain culture conditions. For example, P. chrysosporium did decolorize Remazol Brilliant Orange 3R in solid culture. However, in agitated (200 rpm) pelleted cultures substantial (85% in 18 days) decolorization occurred. Similarly, it was shown that decolorization occurred more rapidly in agitated liquid cultures, in which fungi formed pellets, than in stationary cultures in which the fungi were present as mycelial mats. Although Bjerkundera sp. BOS55 was superior in its ability to cause decolorization in solid agar cultures, T. versicolor was superior in agitated pelleted liquid cultures. This will be problematic for reactor development because selection of micro-organisms to be used cannot necessarily be based on their performance in solid agar culture. Thus the effectiveness of a micro-organism for dye decolorization will have to be judged on the basis of conditions similar to those under which it will be used in actual wastewater treatment systems. Swamy and Ramsay (1999a,b) also assessed the ability of Bjerkandera sp. BOS55, P. chrysosporium and T. versicolor to decolorize the 5 dyes added sequentially, each after the dye last added had been completely decolorized. In the last step of this experiment all of the dyes were added as a mixture. In this experiment, only T. versicolor was able to degrade all of the dyes. Indeed, P. chrysosporium and Bjerkandera sp. BOS55 lost their decolorization ability following decolorization of Amaranth and Remazol Black. This investigation demonstrates that the most effective fungal system for decolorization will depend on several things including the choice of fungus, the buffer, the dyes to be degraded, and culture agitation. Knapp et al. (1997) showed that strain F29, obtained from an unidentified fruiting body from a white rot fungus found growing on rotting willow wood was able to cause substantial (98%) decolorization of water containing up to 1000 mg/L of Orange II in only two days. This is remarkable as Pasti-Grigsby et al. (1992) showed that it took P. chrysosporium 15 days to achieve 53 and 99% decolorization of water containing 300 and 150 mg/L Orange II, respectively. Knapp et al. (1997) reported that a carbon source other than Orange II was required for decolorization and that a small amount of nutrient nitrogen (0.25 g dm-1) seemed optimal and necessary to maintain decolorization ability in long-term experiments. A pH of 5.3-6.3 appeared to be optimal. Addition of veratryl alcohol provided a slight improvement in the rate of decolorization. However, addition of Mn(II) resulted in a decolorization rate 70% greater than that of controls to which no additional Mn(II) was added. These results led this research group to use this fungus in the development of bioreactors (Zhang et al. 1998) as discussed elsewhere in this review. Pointing and Vrijmoed (2000) studied the ability of Pycnoporus sanguineus to decolorize two triphenylmethane dyes (Bromophenol Blue and Malachite Green) and two azo dyes (Orange G and Amaranth). These investigators also found that the azo dyes were more resistant to degradation than the other dyes studied. 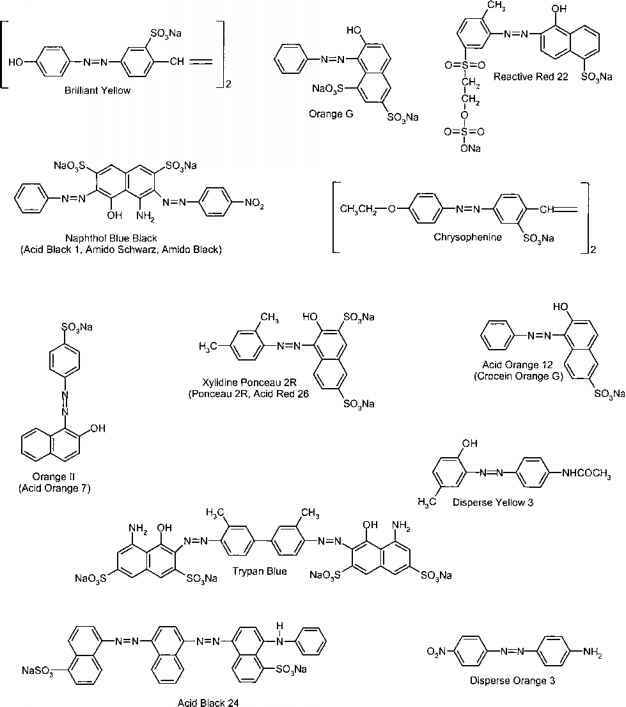 Complete or nearly complete decolorization of the triphenylmethane dyes occurred while only partial (up to 60%) decolorization of the azo dyes was observed. Adsorption of dye to mycelium was not a major factor in decolorization by this fungus. Yesilada et al. (2002) showed that Funalia trogii in pelleted form could decolorize relatively high concentrations (264 mg/L) of Astrazon Red FBL. Astrazon dyes are widely used basic dyes. In these investigations, which were the first to study biodegradation of Astrazon dyes by a white rot fungus, it was shown that at a dye concentration of 13 mg/L, fungal pellets could be reused up to five times with great effectiveness (i.e., 92-98% color removal occurred). At higher concentrations (264 mg/L) similar color removal was observed only when an increased amount of fungal mass was used. 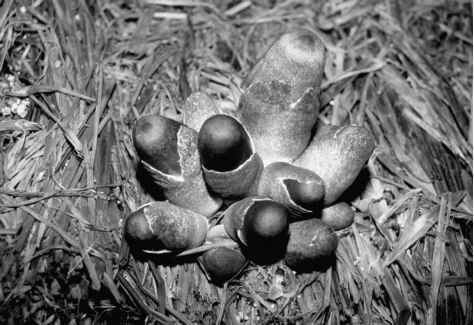 However, in these experiments, repeated use of the fungal pellets resulted in lower amounts (0-73%) of decolorization. It appears that the dye is toxic to the fungus at high concentrations. Nevertheless, it is clear that fungal pellets can be reused several times to remediate water containing dyes at concentrations that might be expected to be present in wastewater. Also of importance was the observation that dye degradation occurred over the pH range 6 -11. It should also be noted that, like several other white rot fungi, dye adsorption by fungal mycelium was followed by decolorization of the mycelium. Chagas and Durrant (2001) compared the ability of P. chrysosporium and Pleurotus sajorcaju to decolorize four azo dyes. P. chrysosporium in solid culture medium partially decolorized Amaranth, New Coccine, Orange G, and Tartrazine. P. sarorcuju decolorized Amaranth, New Coccine, and Orange G. It did not decolorize Tartrazine. In liquid cultures of P. chrysosporium total decolorization of Amaranth, New Coccine, and Orange G and 60% decolorization of Tartrazine was observed. P. sajorcaju mediated total decolorization of Amaranth and Coccine, 50% of Orange G and 20% of Tartrazine. In these investigations, lignin peroxidase activity was not observed. However, manganese peroxidase activity was observed in cultures of P. chrysosporium and laccase activity was found in cultures of P. sajorcaju suggesting that these enzymes are important in dye degradation.